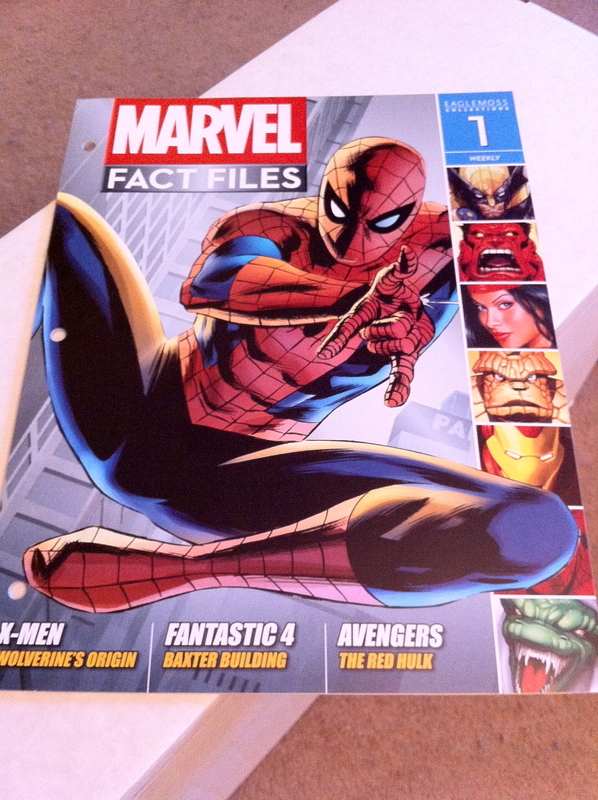 The first issue of Marvel Fact Files from Eaglemoss has hit newsagents and supermarkets, and at a very reasonable 99p, however this goes up to £2.50 starting with issue two and with the publication being released weekly costs can quickly mount up, is it worth it? The aim of the magazine is to tell the history of the Marvel Universe for those who want to get into reading Marvel comics, or just want an easy reference guide to call upon. The magazine itself is split into seven different sections that are mean to be pulled apart and put in a folder that comes free with issue two, fans of The Official Star Wars Fact File will be familiar with the format, it does feel a little strange to pull apart a magazine you’ve just bought but it will make things ultimately easier to refer to in the future. This first issue has a mix of pages from each section with a particular focus on X-Man Wolverine, though subsequent issues could focus on any part of the Marvel universe so some issues will have a lot more interesting articles than others. The pages are filled with some beautiful art from the entire Marvel back catalogue, though this issue does feature an abundance of modern art, in particular that of David Finch, as such there is not as much room left for the actual article. As anyone who’s tried to unravel the in universe history of comics knows things get complicated FAST, the articles here try to keep things simple and focused only dealing with the main events and leaving the details to the original comics. That said the articles are surprisingly well researched and up to date. One of the main problems with publications like this is they are written so far in advance that by the time they’re published they’re already obsolete, however theres articles in the first issue detailing new characters like the Red Hulk and even Spider-Man’s Future Foundation and Sinister 6 costumes. Naturally the fact file will become out of date with time however, especially with big events like the end of Amazing Spider-Man just around the corner. The articles are well written and fun to read if you’re interested in the Marvel universe and find out more about the lesser known areas, however I doubt it will appeal to those coming in from outside the comic world. The collecting and filing of the pages should be familiar to comic book collectors however I think £2.50 is a tad high a price to put on a weekly publication where some articles might not even appeal to the reader. As always with these kind of magazines if you subscribe to it you receive a few free gifts, however notably here you also get access to a digital copy of the magazine as well. I’d love to see access to this digital archive become accessible to everyone, maybe for a small fee, as it’d be a brilliant source of information on the Marvel Universe, almost like an official wiki. Starcraft 2 going free to play? How do you get the binders? How many issues will fit into each binder…It looks like it will fill very quickly!